This week we had fun with some of my finds from the Dollar Tree. And just because they involve eggs doesn't mean we won't keep using them. 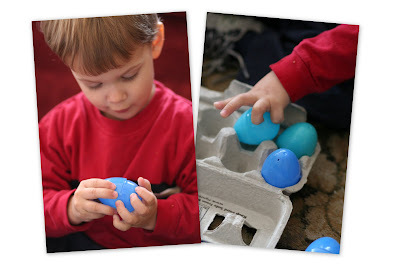 :) I found some other cute ideas that use all those extra plastic eggs, so hopefully this week I'll get working on those too. Kaleb started actually pronouncing his 's' this week - so his 'yea' turned to the sweetest little 'yes' (or really a 'yeth'). Just to cute. He is coming into his goofy personality more and more, making us laugh at every turn. I pulled the plastic eggs apart and Kaleb spent some time first matching the colors and then matching tops and bottoms of the eggs together. 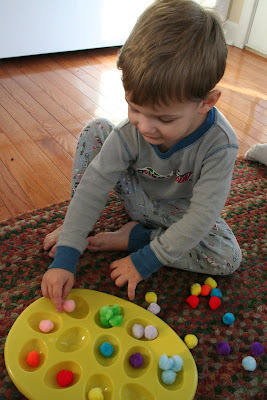 We pulled out two bags of pom-poms and an egg coloring tray (all Dollar Tree) and used the tray to sort the pom-poms by color. 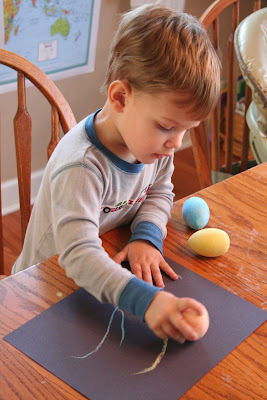 Then Kaleb used some chalk eggs to draw on black construction paper. I made a paint swatch matching card using nine different colors and clothespins. 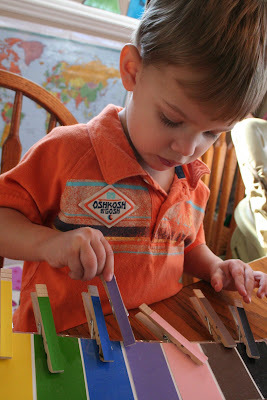 It took Kaleb a little bit to get used to opening the clothespins (and keeping them open), but after help on the first few, he figured it out and matched them all. 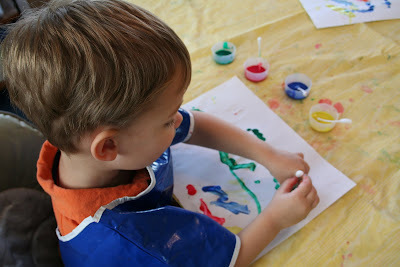 We pulled out the paints this week too - and used q-tips to paint a few pretty pictures. 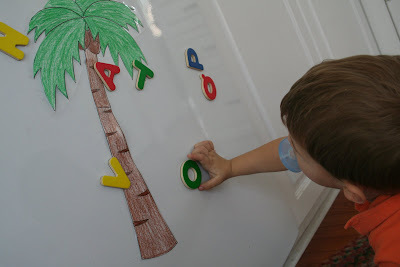 After reading this ABC post on Totally Tots, I printed off the coconut tree template and stuck it on our dishwasher for Kaleb to play with. Kaleb had fun picking up letter and trying to name the letter or color. That's it for this week. 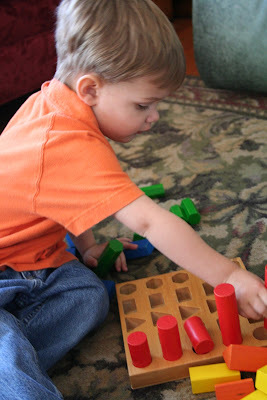 Don't forget to visit Carissa at 1+1+1=1 for some more Tot School posts. I too love the dollar tree, a little imagination can make it a long way! Thanks for sharing your ideas! Gotta love those dollar store finds! I can't wait to see what you come up with for all of those eggs! Wow! It really looks like you found really good stuffs. Kaleb seems to be very creative and it looks like he had fun in the pictures too. I just found your website and I love it! I was wondering, who is the "shape matching/sorting puzzle" made by? I would like to get one for my son. LOVE the paint swatch idea!!! LOVE LOVE LOVE! Saving for later! OH! Where did you get that shape sorter puzzle thing? I love that! I looked at the shape sorter you linked to your sidebar. It's a little different than the one I see in your pics. I prefer yours in particular because it has a hexagon, each shape is the same color, and it has 5 different heights. Would you mind sharing where I can find that one?